This book explains philosophy to kids in an easy-to-understand way, using simple text and fun illustrations. It is the perfect introduction to the great thinkers who, from ancient times to the modern day, have tried to make sense of the world by asking questions such as: "Who am I? ", "Is the world real? ", "Is it ever right to tell a lie?". Meet Socrates and Confucius, Kant and Sartre, and many others who have studied and pondered on the complexities of everyday life. 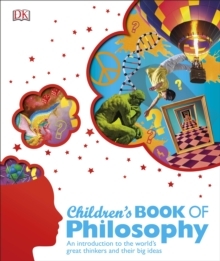 Looking at the major philosophical theories, The Children's Book of Philosophy brings big ideas within the reach of young minds. It examines the problems that have puzzled people for hundreds, or even thousands, of years, working through them in clear and logical stages. The book's lively approach is designed to encourage children to start thinking for themselves and to show them that anyone be a philosopher.